It is hysterical, as there were butterflies in my tummy at the thought of going to Lentils this morning. 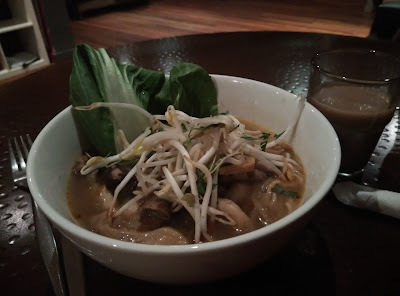 vegan Tom Yum soup at Lentils. I've been away from everyone since last Wednesday... The thought of seeing people after my time away filled my mind with all kinds of imaginary dragons, lizards and snakes. And my dragons I did slay today. Well, at least the first few of the dragons. The important ones... And a couple of exciting news. And guess what? I survived. But that I can wait. Don't ask me how I ended up staying at Lentils all day. What was even more hysterical was I could mistake grapefruit for oranges. I baked grapefruit cakes thinking they were oranges... >_< what a mistake. cosmos thought they were tartly nice and bitter. and encouraged me to take some cake home to experiment with the textures and taste. so I did. Am I excited about the Job prospect? Not particularly. But it was an opportunity to see behind the doors how a Japanese Noodle bar operates and I wasn't going to let that chance pass me by as I enjoyed Japanese cuisine, and wanted to learn more about Japanese cuisine.